Make your driveway instantly visible at night with the Mayne Solar Post Light. This bright white LED sits inside of a vinyl casing crafted specifically to match your existing Mayne mailbox post (not included). The top of the peaked cap features a solar panel, which harnesses energy from the sun and uses in to charge the two included Nickel Cadmium AA batteries. With the aid of a light sensor, the LED will automatically activate at dusk and will remain on until dawn, or until the batteries' charge is depleted. Installation is simple; just use the included hardware to mount directly over the top of your existing mailbox post. 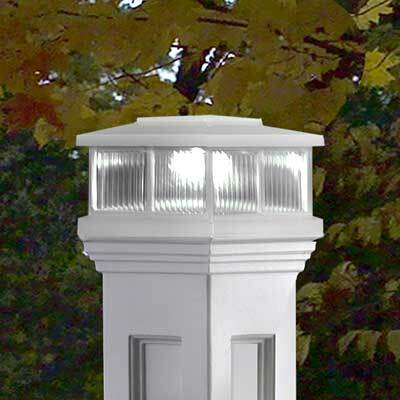 Dramatically light your curbside with the White Solar Post Light. Two year limited warranty. Note: This item is not designed for use with the Mayne Bradford, Liberty, Charleston, or Statesville mailbox posts.